This mishap with an 0-8-0 possibly no. 1895 which has demolished buffer stops and iron railings. A second 0-8-0 on rescue duty has 4 digit number starting with a '2' but cannot be read beyond that. Ted Lloyd has a view of the same mishap from the opposite side. Is there enough between the two views to identify the location? Subsequent to the original posting, Ted has discovered this view, which has "Weedon Accident" written on the back. It is clearly the same accident as featured in the main picture, but viewed from between the crane and the errant engine. The catch points have done their work at this location in protecting the 'main' line from the 'branch'. There must be quite a steep downgrade at this junction. Somewhere behind all the escaping steam will be an Outer Home signal that this engine and train should have stopped at until it had a path through the junction. It is certainly not Weedon Junction as the branch to Daventry is on the opposite side of the 'main'. Warwickshire Railways web site provides the answer - Folley Lane, later renamed Humber Road Junction, at the south end of the Coventry loop, opened in 1914/15 and closed at electrification. The Warwickshire Railways web site is still under construction but it has already a superb collection of photographs and information. Sorry to put a spanner in the works, but there was no buffer stop at Humber Road, which controlled a basic double junction only. It could be at Gosford Green, not far away along the Avoiding Line, or Whitley Wharf, down the main line (next to London Road cemetery) which each had a type 5 signalbox. Whilst perusing the Mystery Photos section I saw Reg Instone's comment, "Sorry to put a spanner in the works, but there was no buffer stop at Humber Road, which controlled a basic double junction only". Unfortunately this is wrong, as may be seen here. 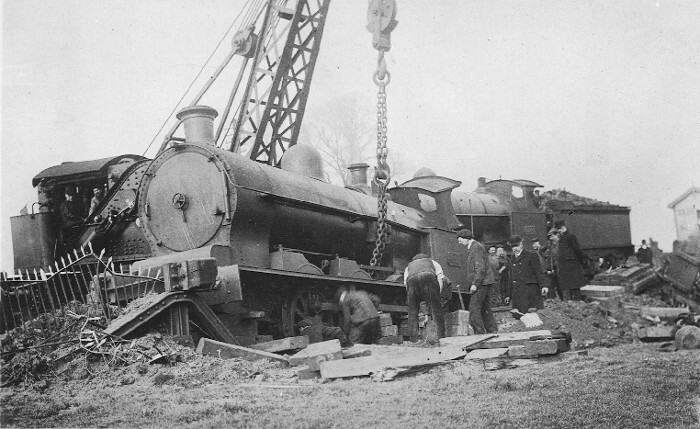 The crane is Cowans Sheldon 2987 of 1908 which was delivered to the LNWR and based at Rugby until 1931. Latticed jibbed and capacity of 25 tons.